All liquids in which water dissolves additives have a pH level, a measure of acid vs. alkaline (basicity) content. That’s pH. The pH scale ranges from 0 to 14, although reading can exceed either end of that range. Battery acid has a pH of zero. Liquid drain cleaner has a pH of 14: extremely alkaline. Neutral pH is 7.0, and the human body needs a stable pH of 7.365. When we ingest anything containing chemicals that drive pH levels above or below neutrality, our body chemistry works to metabolize and restore the healthy human pH level. Concrete does the same with the pH of its contents and additives. Interaction is the point. Pure water is pH neutral, but we add a world of other contents to it. Concrete manufacturers mix aggregate and cement to water, and the pH of that water changes. Producers ensure that the pH level is prime for strong and stable concrete mixture. Beware: contractors need to maintain that healthy pH in concrete during installation and flooring. Two critical pH levels need to calibrate for success in flooring installation: pH of the concrete and pH of the adhesives used in flooring. Contractors fuse pH contents when they apply adhesives to bond a floor covering to concrete. If the pH guidelines are not compatible, the adhesive bond may break down. The flooring project is jeopardized. Did you know that the concrete’s RH level changes the concrete’s pH? It does. In fact, high RH levels are directly related to high pH levels. So, RH influences not only the integrity of the concrete but also the integrity of adhesives applied to it in flooring applications. We resolve potential pH problems by maintaining healthy RH levels in concrete. This must be done to ensure a successful installation, anyway. Once poured, concrete needs to hydrate. Water vapors need to migrate from the bottom of the slab to the top in order to evaporate. Easy enough. However, the RH of air surrounding the slab also influences concrete RH. Lower RH speeds up evaporation; higher RH slows it. It makes sense, then, that changes in RH also destabilize pH levels. This is why concrete must be given adequate time to form and strengthen (“cure”) and hydrate. These processes ensure not only prime RH levels but also prime pH levels. Establish those, and you can lay down the floor covering with the assurance that appropriately-selected adhesives will bond as they should. If every concrete slab has its own chemical equilibrium process, imagine the stakes for installers of huge concrete structures. Every floor of every hospital (for example), every foot on every floor, requires a massive investment in the establishment of safe RH levels. The opposite is also true. Litigation for poorly installed concrete and flooring will cover every floor of the hospital, every foot applied to every floor. 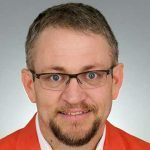 In such cases, entire projects can be derailed and bankrupted due to our neglect of a simple chemical process inherent in every concrete and flooring installation. Every raindrop can influence the hydrogen ion process that it touches. 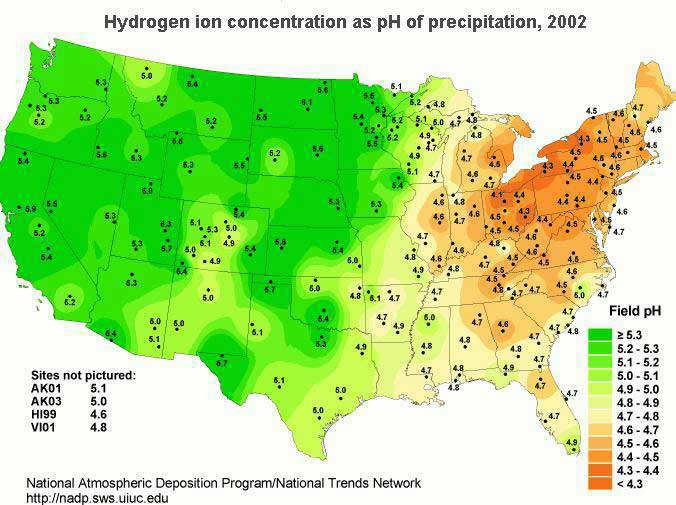 Here is an example of how precipitation influences pH levels all over the United States. Concrete and adhesive manufacturers produce guidelines which installers must consider before proceeding with a certain product in a certain region. 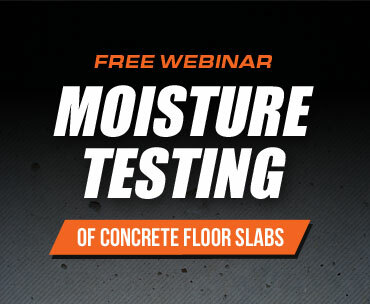 Changes in local weather, humidity and seasons all influence the success of flooring installation involving concrete. Field pH, as defined above by the US Geological Survey, differs all over the world. Ensure that the manufacturers’ guidelines make your chosen flooring product compatible with all variables, including pH and RH. Simple assessment tools exist for both RH and pH. If you’ve ever responsibly maintained a fish tank, you already know that pH tests are simple. Testing for RH is more technological. 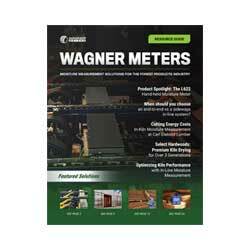 In fact, Wagner Meters has developed proprietary digital technology for digitally measuring RH levels in concrete. Wagner Rapid RH® series provides an immediate, accurate and cost-effective way to discover RH levels at varying depths and locations in a concrete slab. Contractors install calibrated, single-use RH probes at 40% slab depth. Contractors read RH probe data from a hand-held meter. This method means that subcontractors can take multiple measurements to accurately determine when a concrete slab has reached a “dry” condition. 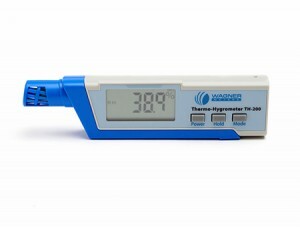 Wagner’s methodology lets installers put precise RH measurement in their belts along with the other tools that make their trade successful. Take care of RH, and you take care of pH. It’s a two-for-one deal that is sure to make project managers smile.